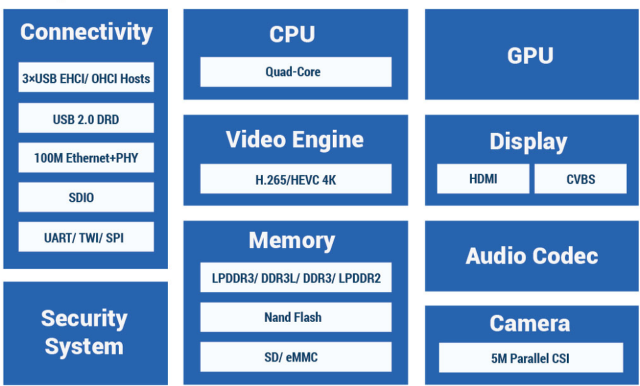 Allwinner launched their H-series processors (Homlet) for home entertainment with Allwinner H8 octa-core processor, supporting HEVC up to 1080p, which will find its way into media players selling between $50 and $80. The company has now added Allwinner H3 quad core processor, selling for just $6, which will be available in $35 to $50 OTT TV box later this month, and include support for 4K UHD H.265/HEVC video playback. Video Output – HDMI with HDCP, CEC, 3D function, CVBS, and dual independent display support. The company mentions that while the CSI camera supports up to 1080p30 video recording, USB camera are limited to 720p30. This processor will be found in OTT TV boxes that compete with Realtek RTD1195 media players, as both platforms feature low power ARM Cortex A7 cores, albeit dual core vs quad core, a slow Mali-400MP GPU, and support for 4K UHD video playback with the latest H.265 video codec. However, Allwinner H3 loses out to its competitor by lacking SATA, Gigabit, and USB 3.0 interfaces, so H3 based products might become cheaper media players, but they won’t have the NAS compatibilities of the Realtek processor. The first TV boxes powered by Allwinner H3 processor are expected later this month. Can you clarify the difference between H3 and H6? I think he meant H3 but a typo occurred. Sorry, @Marius is right, It’s only H3, there’s no H6. “will be available in $35 to $*50* OTT TV boxes”? Do you kow if 3d video are full supported? And iso image? No gigabit ethernet.. not worth it. I will stick to the Banana Pi. Have you heard anything recently, any update, about Allwinner developing a quad-core SoC pin-compatible with the A20? Or are the news about it only speculation? I’ve only heard it via Olimex a little while ago. Nothing from Allwinner. Usually they will contact me once they announce a new chip.